Goodman turned to Urbanite, a division of Frost*collective to design an environmental communication solution to build awareness of its thirteen-billion-AUS-dollar business. Over a four-year period the design team created, designed and installed a series of installations. 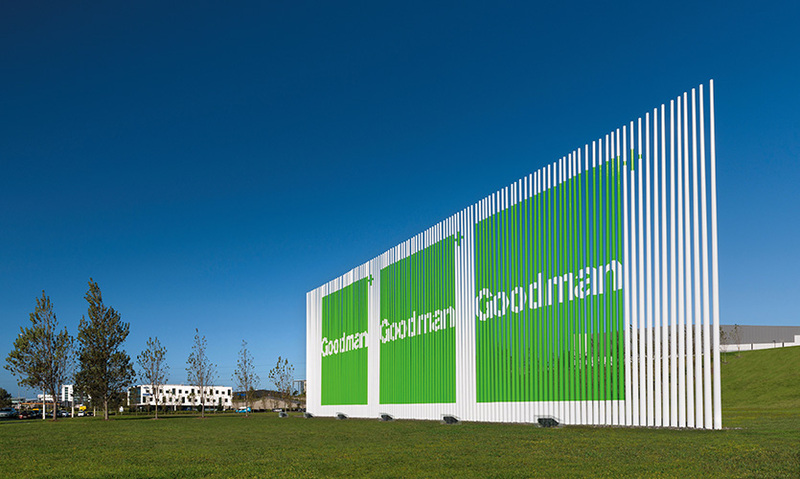 Goodman’s mantra of doing ‘business outside of the square’ served as a guiding principle for the design team, and the collective creativity of the design team resulted in larger than life installations in key market locations. After significant research and strategic and tactical efforts on the part of the design team, Urbanite’s approach was bold with high visual impact. All of the Goodman installations are modular and designed for reuse and transportation, because it was crucial to the international company to communicate across languages and borders. 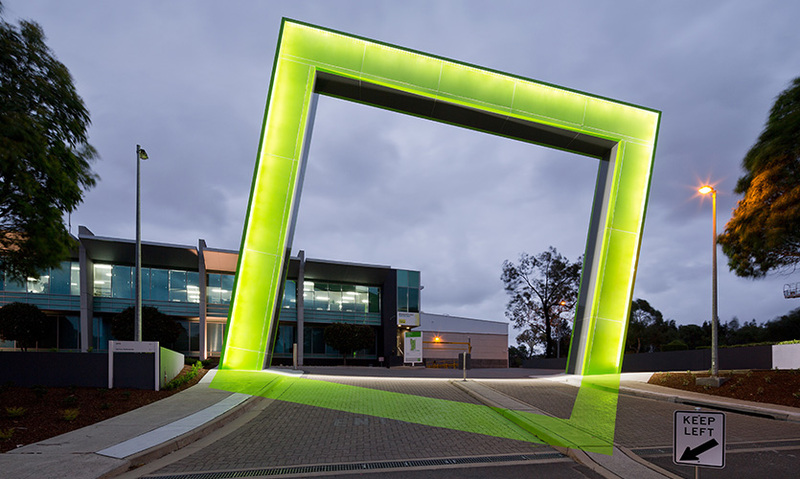 "Gateway" is featured at St. Peter’s Business Parks in Sydney, Australia and in China. "Kinetic Grasses" uses poles to create a visual fence. 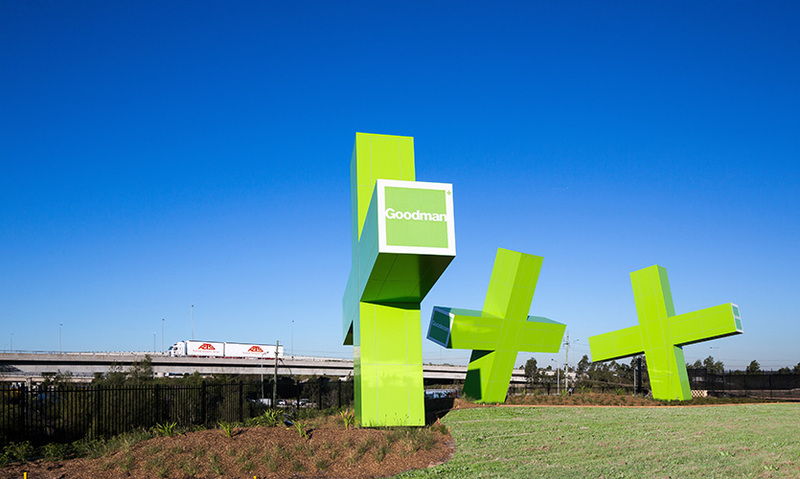 The sculptures delineate the site’s boundary and incorporate the Goodman logo, which is revealed on approach and dissolves as viewers pass it. As the largest industrial property group listed on the ASX with 188 properties nationally and operations in 33 cities stretching across 16 countries, Goodman turned to Urbanite, a division of Frost*collective to design an environmental communication solution to build awareness of its thirteen-billion-AUS-dollar business. Over a four-year period the design team created, designed and installed a series of installations. The design team was faced with the rather unique challenge to raise awareness of the Goodman brand to a particularly targeted niche audience. Urbanite sought to make Goodman more visible in key markets by focusing on five high-profile Goodman locations, thereby illustrating the diverse range of business sites that Goodman has to offer. Goodman’s mantra of doing "business outside of the square" served as a guiding principle for the design team, and the collective creativity of the design team resulted in larger than life installations in key market locations. After significant research and strategic and tactical efforts on the part of the design team, Urbanite’s approach was bold with high visual impact. Creating placemaking with presence was an obvious goal but there was much more for the design team to consider, such as color, materials, flexibility and lighting. Working in concert with Goodman meant that the Urbanite team could arrive at a powerful idea that could creatively communicate the business’ purpose and values in an engaging and inspiring way. 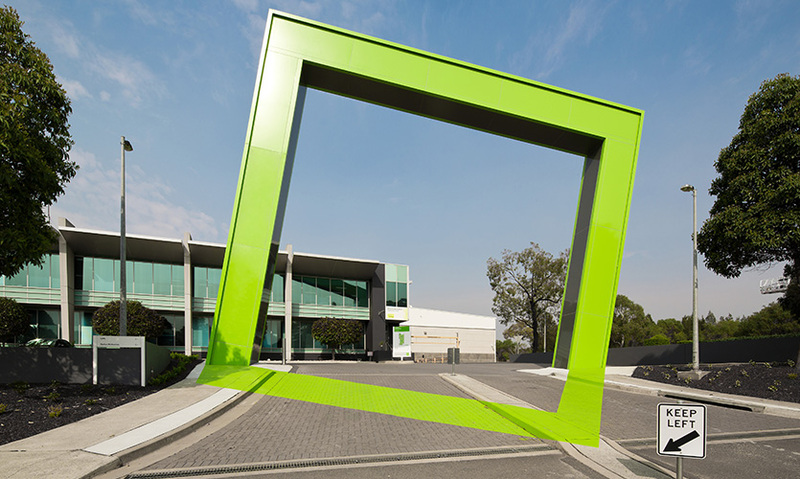 The placemaking series is made up of "Gateway," featured at St. Peter’s Business Parks in Sydney, Australia and in China. 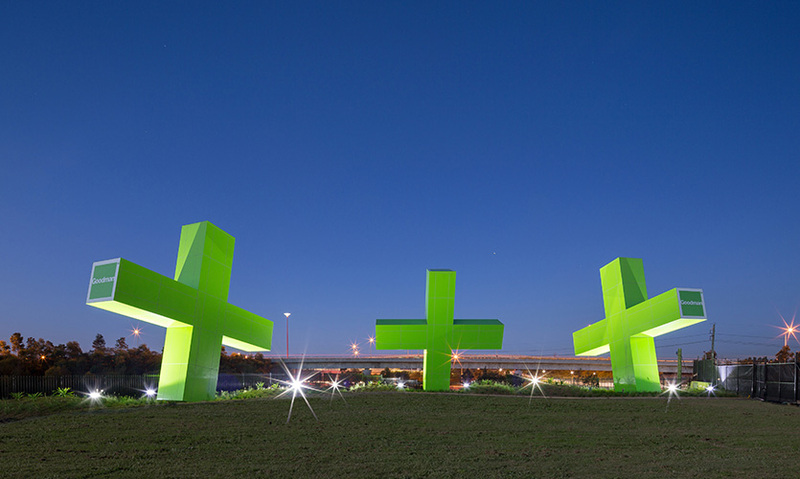 Another installation, "Giant Plus," is located at Interchange Park, Eastern Creek and was assembled from a steel framework and cladding with integrated lighting. This allows for each piece to glow at night, thereby providing around-the-clock brand awareness. Finally, "Kinetic Grasses" uses poles to create a visual fence. 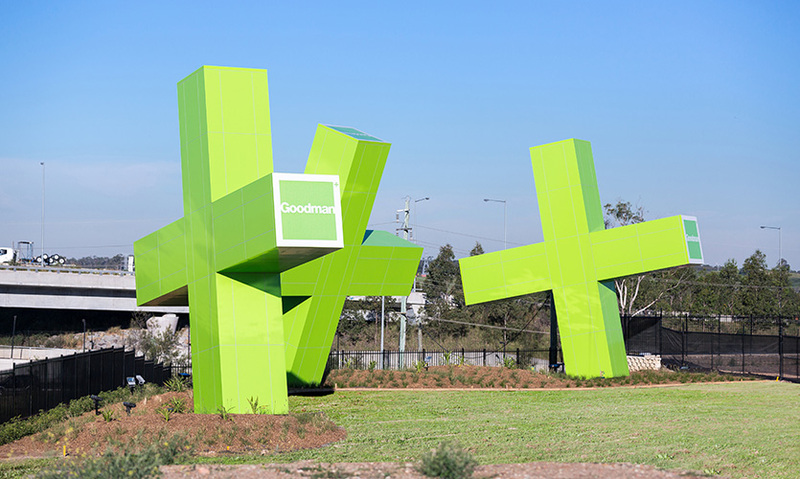 The sculptures delineate the site’s boundary and incorporate the Goodman logo, which is revealed on approach and dissolves as viewers pass it. All of the Goodman installations are modular and designed for reuse and transportation, because it was crucial to the international company to communicate across languages and borders. The designs suit diverse, global typologies and successfully communicate Goodman’s mantra of doing "business outside the square." Perhaps the most lasting praise is that Goodman leaders such as Ms. Brink feel that the installations are an artistic and innovative way of communicating the brand and that the finished products are a feat of creativity and engineering—an early challenge faced by the design team, and one that they carried forward to a successful conclusion. "The bold colors, large form factors, and unique placement help define an otherwise plain industrial property. The elements reflect the brand system and play off of the existing angles of the industrial building." 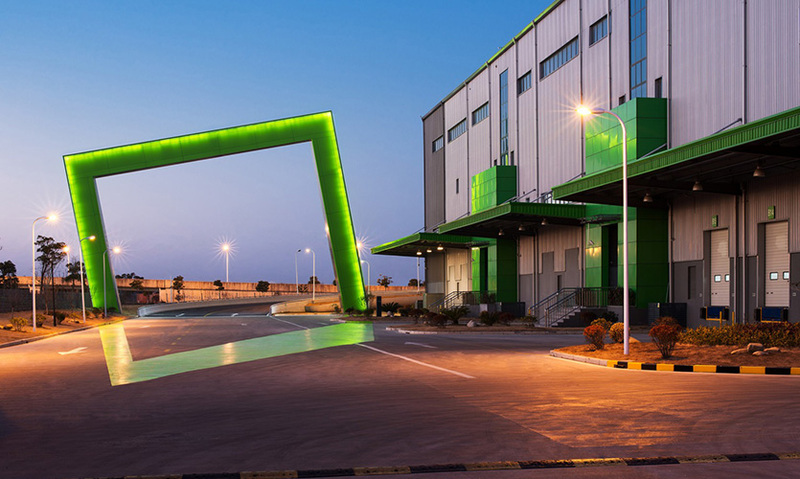 "Blue-chip industrial and business spaces are sculpturally marked by Goodman realty’s distinctive green identity. An illuminated and pavement painted gateway frames handsome architecture and landscape. A roadside array of + + + is an appropriate rating for this memorable Australian environmental graphics submission."